Pondering the beautiful art and inspired words in Passion for Place, I am reminded how much is at stake in the way we humans respond to our world. How we see greatly determines the fate of what we see. How we see watershed is truly a matter of life and death to all the creatures in it. What is at stake in seeing the Earth as if what happens to it were our own responsibility ? If we experience river and tree, rock and fellow creature, mountain and petal, fish and whole valley as if they were our own—that is, if our moral imaginations move us from conceiving “the Earth” to “our Earth,” from something detached and separate from who we are, to “our Earth,” to “us”—that changes everything. We find ourselves connected vitally and spiritually to our own given habitat. Going from “the” to “our” to “us” in our thinking transforms how we act. 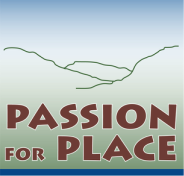 Passion for Place inspires us to slow down and take the time to engage the river as it gleams, to feel the warm breezes blow, to hear the birds sing and trees rustle, to watch carefully as the mountain lion softly treads. Through the lenses of art and poetry, sound and story, we experience the watershed and all of its elements with reverence and respect. Earth reappears in our minds as wondrous. We see. We hear. We feel. We remember. We Act.